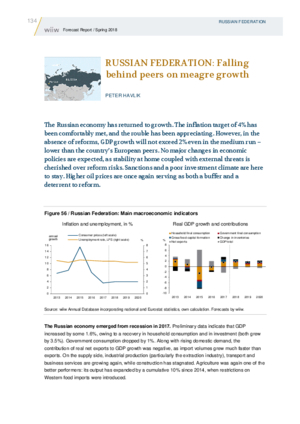 The Russian economy has returned to growth. The inflation target of 4% has been comfortably met, and the rouble has been appreciating. However, in the absence of reforms, GDP growth will not exceed 2% even in the medium run – lower than the country’s European peers. No major changes in economic policies are expected, as stability at home coupled with external threats is cherished over reform risks. Sanctions and a poor investment climate are here to stay. Higher oil prices are once again serving as both a buffer and a deterrent to reform.